One of the best (and cheapest) ways to spend an evening in Johannesburg is to go to the Drive-In- a South African Institution. There is nothing better than watching a great film under a starry sky! We often load up the car with friends, camping chairs, mattresses (we like to get comfy), snacks and a tipple (or three) and set up camp for an evening of old school movie watching. Unfortunately there is only one Drive-In left in Jozi, Velskoen, just off Malibongwe Drive in Randburg. Velskoen Drive-in hasn’t changed in decades but that is what makes it so fab! It is open every evening from about 19h00 and it costs R70 per car for a double bill. The first movie starts at 20h00 and the second at 22h00. Velskoen is for everyone- a couple on their first date, a family with kids (the kids can be tucked into bed on the backseat for the second film) and even a group of university students looking for a cheap night out. What got me thinking about the Drive-In, is last week, I was exploring the city and ended up at the old Top Star Drive-in. 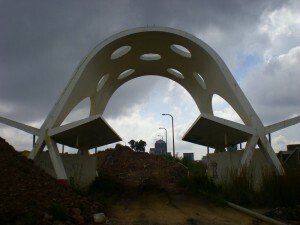 For those who don’t know Top Star was a very unique Joburg Drive-in as it was situated high above the city on an old mine dump. 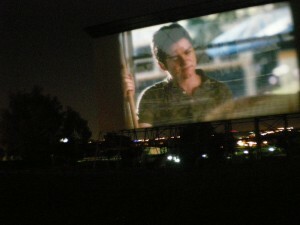 From the 1960’sTop Star was the finest Drive-in with views of Joburg for miles around. 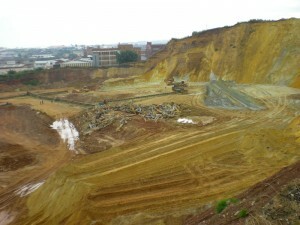 Unfortunately it closed down in 2006 and is now nearly completely gone as the mine dump it was situated on, is being reprocessed for gold. The only reminder that Top Star was ever there is the fab 1960’s style entrance that still remains. What a pity that nearly all the Drive-Ins have gone! This makes it even more important to support Velskoen. So if you are looking for something fun to do, get your friends on board and head out to a night at the Velskoen Drive-in. You will love it. Fill the car boot with camping chairs, pillows and, for winter, blankets and sleeping bags are a must! Snacks are crucial: you will need to pack a picnic, take some cash for the diner at Velskoen or if you would really like to make it a retro night, start with dinner in your car at a road house. I recommend the “Choose a Burger Roadhouse” on Beyers Naude- they do great food which they place on a tray hooked onto your window. A must have is one of their shakes-totally yum! A cooler box with drinks or a flask of hot coffee (for those chilly nights) is essential! And, last but not least,arrive early and get a good spot! The malibobgwe drive-in also closed down. Its so sad to see the end of the Drive-in. 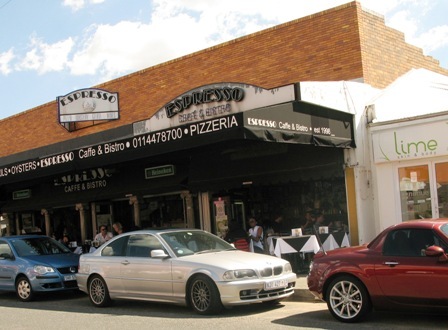 My family and I lived in Johannesburg in the sixty’s and seventy’s, our kids were born there so you must know that was the place to go to have your dinner on the window of the car and see the cinema. How times have changed. Best Regards to you. Ray and Wilma Hanna in Antrim Northern Ireland. Id like to find out if this establishment still exists?I last saw it in about 2009/9. I am interested in opening one in my home town. I have done some background search, and see that Velskoen in Johannesburg is permanently closed as mentioned on their Facebook page. In saying this, this post was written in 2011 I would suggest maybe you go to a Tourist Information in your area and ask, they should be able to give you further information. Hi how safe is it there i would love to take my kids ihave always wanted to have them experiance what it is like going to a drive-in. Is the drive in off Malibongwe still open? Jo, they snagged you! Fabulous! I will be following your posts from Oz. Pass the popcorn, please. Yip! Its a pity they had to loose you though. Let us know how it goes- Joburg will miss you!